A flypast as part of an event marking the centenary of the RAF has been cancelled - because of the weather. A special event was held in Bangor Cathedral on Saturday morning ahead of a presentation at the town's war memorial. 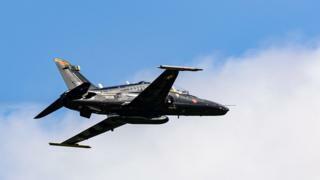 A Hawk aircraft from RAF Valley was due to make a flypast but it was cancelled owing to low cloud cover. Events marking the RAF's anniversary have been staged in recent weeks, including ones in Swansea and Gwynedd.